Breakfast Pre or Post Exercise? Early morning workout? Athlete practice or simply exercising to be fit, many of us train first thing in the morning. 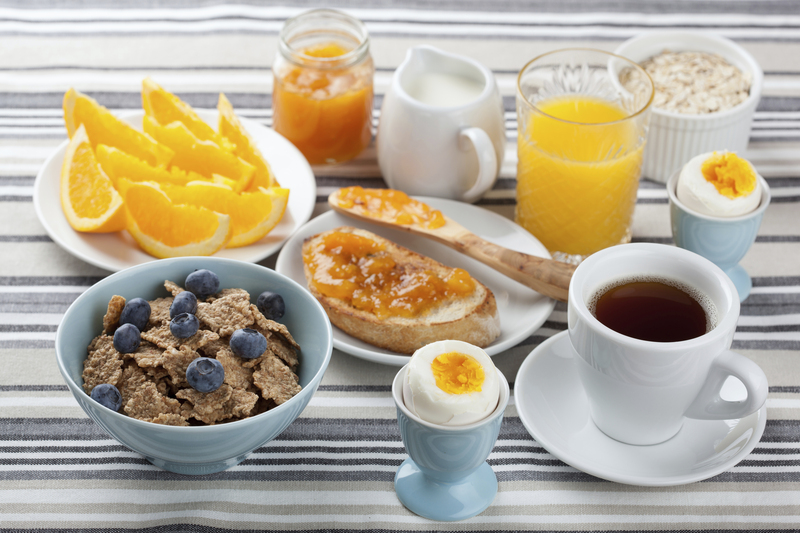 Since breakfast has come to be known as the most important meal of the day, the question rises, should you fuel up before hitting the field or use breakfast to re-fuel after exercising. The answer depends on your goal for that exercise session. Ask yourself if you are 1.) trying to burn fat and drop some weight, 2.) simply maintain good health, or 3.) improve sport performance. Your answer will depend on which breakfast route is best for you. 1.) Definitely eat your oats (or preferred breakfast choice) after exercising. If your goal is to burn fat and slim down, your body does this better if you have less food in your belly. When your exercise is going to be less than an hour at a moderate level, exercising with no breakfast after an overnight fast may help you lose weight. Although the underlying response responsible for this is not clearly understood, it is suspected that the increased adrenaline resulting from exercise keeps your metabolism higher following exercise. When food is consumed prior, it may be possible that the insulin released in response to breakfast blunts the adrenaline response and resulting rise in metabolism. If you plan to take part in an intense exercise session first thing in the morning or exercise for more than an hour, you may need to include a small amount of carbohydrate (like sport drink, or dried fruit) during your exercise session. 2.) To be healthy the timing of your breakfast is not real important as long as you make proper food choices, you fit your breakfast foods into your calorie allotment for the day, and it does not affect the food choices/portions you make for the remainder of the day. Eat your breakfast whenever it makes you feel the best. 3.) Like Merry and Pippin in “Fellowship of the Rings,” if you are an athlete, or planning a long trek, you may need to have a “first breakfast,” and “second breakfast.” Research clearly shows you are able to exercise with greater intensity and for longer duration if you eat prior to training. The amount and type of food you choose prior to training is important in order to reap the benefits. Choose a small breakfast that is low in fat, moderate to low in protein, and high in carbohydrate. Such a type of breakfast will be more rapidly digested and absorbed, which makes fuel readily available to power you through your workout. It is also less likely to cause any stomach upset. Try a banana, half a bagel, and large glass of diluted apple juice. Following training, it is important to re-fuel and begin the recovery process as quickly as possible. Performance enhancement begins here as the re-building process is what allows your body to handle a greater load during your next training session. Reach for a balanced meal, including ample carbohydrates from fruits or vegetables, which are rich in anti-oxidants and aid recovery. Also include lean protein to rebuild muscle. Healthy fat, especially Omega-3 fatty acids (found in fatty fish) and Alpha Linolenic Acids (found in nuts and seeds) can combat inflammation. A great choice might be Greek Yogurt with berries and muesli. Log on to: 10 Healthy Breakfast Ideas for more anytime balanced breakfast ideas.